The all-new 2019 Ram 1500 is already redefining what a pickup truck is in the Central New Jersey area since a lot of what you love is still there, but improved upon greatly. It’s a combination of amazing features with a redesigned look and even better capability under the hood. Before we get into what’s new, the 2019 Ram 1500 is offered in the Tradesman, Big Horn, Rebel, Laramie, Laramie Longhorn & Limited trims. Even though this is fewer trim choices than the 2018 edition, you’ll get even more of this truck. We know that you want the world at your fingertips when you’re on the road. 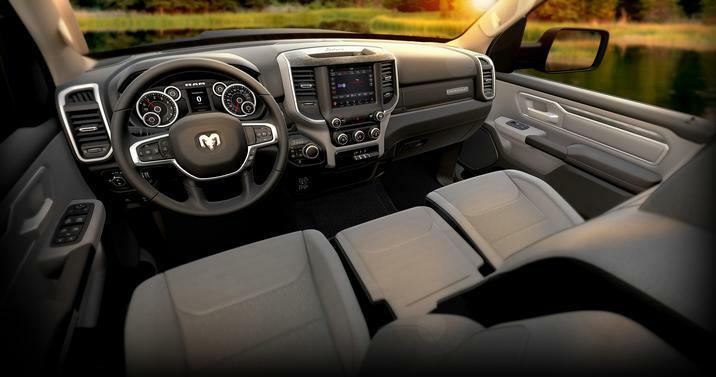 And the 2019 Ram 1500 can do just that whether you’re driving around town in Union County or on busy highways like the NJ Turnpike, Garden State Parkway and I-78 thanks to 4th-generation Uconnect with either a 8.4” touchscreen or a huge & new 12” display with a split-screen functionality for operating 2 applications at the same time. You’ll also be pleased to know that the Ram 1500 gives you access to over 100 safety & security features, including many that are new for 2019. One of them is the Surround View Camera, which displays a 360-degree bird’s-eye view of what’s surrounding the truck on the Uconnect touchscreen, to simplify the process of parking your pickup and avoiding obstacles in the road. The 2019 Ram 1500 has been reengineered to give you even more under the hood with a weight reduction of about 225 lbs. Even with less weight, you still get more power. In fact, the maximum payload capacity has gone up to 2,300 lbs and the maximum towing capacity has increased to an impressive 12,750 lbs, so you can bring even more cargo along for business or pleasure. And believe it or not, fuel efficiency is also going to increased thanks to the eTorque mild hybrid system (belt-drive motor generator unit & 48-volt battery pack). Offered on the models equipped with the 3.6L Pentastar V6 and 5.7L HEMI V8 using TorqueFlite 8-speed automatic transmission, this system gives you start-stop function, brake energy regeneration for the battery and short-term torque assist for both engines adding 90 and 130 more lb/ft, respectively. Salerno Duane Chrysler Jeep Dodge Ram has plenty of 2019 Ram 1500 models available at our Summit NJ dealership location, so contact our team to schedule your test drive to determine which pickup truck is right for you!